Most Americans start the day with a warm beverage. 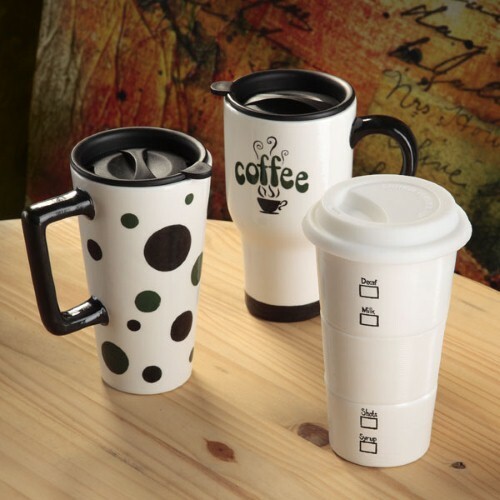 Whether it’s coffee or tea sipped at home, in the car or at work, promotional mugs are a great way for businesses to ensure that a customer starts the day with them every day. Not only will a consumer with a promotional mug have that cup of coffee every day, but the odds are in a company’s favor that it will be theirs. A study by the Advertising Specialty Institute (ASI) found beverage holders were used six times per month on average, meaning if a person drinks a cup of coffee every day during the work week, there’s a one-in-four chance it will bear your company logo. This is even better news in the office setting, where others are guaranteed to read the side of the mug. If they don’t know about the business, it’s likely they will ask someone else or go online to find out more, encouraging more clientele. A company looking to get a boost of recognition while incurring low overhead could get an advantage over the competition by using promotional mugs. This is true of Green Mountain coffee, the Chicago Tribune reported, a large distributor of the beverage, as it struggles to compete with cheaper brands. “We anticipate … increase[d] promotional activity …. for Green Mountain,” said market analyst Mark Astrachan told the Chicago Tribune. He cited other small chains gaining footing at stores that once only carried Green Mountain. The news source reported that the coffee company’s biggest concern was a lack of revenue. It sells its coffee makers at-cost and counts on K-cup sales and other extras to bring in money, but if more consumers are buying competing peripherals, the business could be in trouble. Fortunately for them, ASI’s research found not only are promotional mugs cheap for companies to purchase, they also have a high impact with casual viewers, meaning they’re likely to increase interest and revenue.